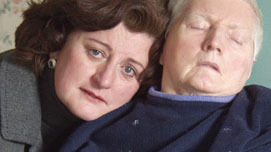 "The Forgetting: A Portrait of Alzheimer's" premiered January 2004. "The Forgetting: A Portrait of Alzheimer's" is a Primetime Emmy award-winning documentary produced by Twin Cities PBS that takes a dramatic, compassionate, all-encompassing look at the growing epidemic of Alzheimer’s disease. The 90-minute documentary is based on the best-selling book by David Shenk. In the film, three individuals and their families bring viewers into the intense, real-world experience of Alzheimer’s disease. Gladys Fuget, still in Alzheimer’s early stage, jokingly denies her memory problems even as we witness her struggling to recognize her own image in a photograph. Fran Noonan wrestles the disease’s middle stage, tormented by outbursts of anger, sadness and confusion. In Alzheimer’s final stage, Isabelle McKenna loses everything but the ability to sense human touch and the steadfast devotion of her family. During each stage of the illness, we witness these families’ tenacity, frustration, grief and humor. At the time of filming "The Forgetting," Gladys and Harry Fuget were a retired couple in their 70s. For several years, Gladys had been slipping into the early stages of Alzheimer’s, which slowly progressed. Initially, words, dates and people’s names escaped her memory. Amidst these struggles, her husband Harry moved into the role of caregiver. He rarely left her side and took over most of her household tasks. Harry was in a position that many caregivers experience: coping with the double stress of added responsibility and losing the wife he’s always known. Harry and Gladys have both died since "The Forgetting" was filmed. The Noonan family carries an extremely rare genetic mutation that — if inherited — guarantees early onset Alzheimer’s. The incidence of this gene mutation that causes early onset Alzheimer’s is believed to occur in just two to five percent of all Alzheimer’s cases. The Noonans have lost their mother and a sister to the disease. In the documentary, they band together to comfort their brother, Butch, — diagnosed with Alzheimer’s just before the filming — and care for their sister, Fran, who, at age 55, already had mid-stage Alzheimer’s and lived in a nursing home. The remaining Noonan siblings live every day knowing they have a 50 percent chance of getting the disease, which, if inherited, could also be passed along to their children. At the time of filming, Isabel McKenna was nearing the end of her journey with Alzheimer’s disease. Her experience with the disease was a difficult, yet typical, progression into late stage Alzheimer’s. She was no longer able to talk and had limited movement. Her husband and daughters had spent 13 years watching the slow progression of her decline. Having experienced everything from home care to nursing home care, they recalled their frustrations, love, fears and realizations as they prepared for the end of a long goodbye. Mr. McKenna died before Isabel, shortly after the documentary aired. "The Forgetting" also offers a window into the world of Alzheimer’s research. World-renown scientists share groundbreaking discoveries on the disease, and explain how and why Alzheimer’s dismantles the day-to-day lives of people like Gladys, Fran, Isabelle and their families. As the number of Alzheimer’s cases skyrockets and the research forges ahead, "The Forgetting"portrays the personal and social impact of the disease, and gives viewers reason for hope. Major funding for "The Forgetting: A Portrait of Alzheimer’s" was provided by MetLife Foundation, Public Television Viewers and PBS. "The Forgetting" was produced by Twin Cities Public Television. The producer and director of "The Forgetting" is Elizabeth Arledge. The documentary is based on the book, “The Forgetting: Alzheimer’s: Portrait of An Epidemic” by David Shenk.